Bean filled body. I may inadvertently omit information that you as a collector feel is important. in very good pre-owned condition. He has KOOKEYS UNLOCK THE FUN machine embroidered on his side. I won't list anything that I wouldn't use myself. Normal wear for a used item should be expected. 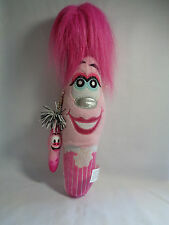 This is a very gently loved Kooky Pen Plush. He is approx. Is red with fuzzy black hair. He is a pirate. Back has KREW 5 VOX #26. Great condition. No stains or tears. Pirate Plush. Dino is new with tags! Be sure to take a good look at all the pictures so you can see exactly what you're getting. Any flaws can be seen in the pictures. Please email me with any questions, I can usually return messages within an hour. Check out our other listings in the Frozen Armadillo Depot store as we will combine shipping! Thanks for looking and happy shopping! Kookeys Calico Cat Unlock The Fun White Brown Black Soft Fur. It is about 29" tall not including its hair. It says on the back "Krew 18 Vikky #143". She is used but is in excellent condition. She does NOT have a stand. Kooky Krew 18 Dripp #140 Plush Red with Blue Hair Approximately 7” Suction cup on top to hang from window or mirror Good Preowned Condition, No Rips, Tears or Stains. Suction Cup shows signs of use Comes from a Smoke Free Home Thanks for Viewing My Listing Have a Happy Day! 10Vox Kookeys Penguin 1JY with code, good condition, smoke free. KooKeys ~Coral Yorkie -poodle. Unlock The Fun ~. Once you checkout I can't do a combined invoice for you. :( So Batteries Not Included. ). "OLIVIA" KREW 19 #147. 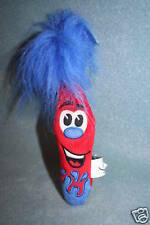 24" TALL KOOKY CREW PLUSH STUFFED. MOCK ADVERTISING PEN. PINK WITH GIRL FACE. This plush stands up on its own. The tag is frayed but the toy is in great shape. Clean and from a smoke free, pet free home. Brown Black Kookey Puppy Dog. Unlock the Fun. Vikky #143. Kooky Bean Bag - Krew 18. Kooky Bean Bag - Krew 19. Olivia #147. Review images for best results. Color- Body light pink with darker pink hair. Color- Body is light pink with bottom is purple color and pink hair. Hanging Kooky Krew 19 W LEO #144 -. 8" tall with attached red cord and suction cup to put on your window. Made of a soft outer material and bean bag filling. This is adorable with a colorful purple body and feathery purple hair top. Kooky Buddy #142 Krew 18. This is the tall 13" one with stand and 5 working pens! Only this one left! 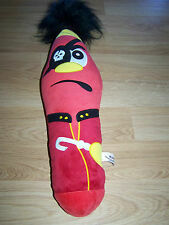 8" TALL KOOKY CREW VOX BEANBAG PLUSH STUFFED. HANGER AND SUCTION CUP INCLUDED. Kooky Bean Bag Plush Enrico #146 Krew 19 w/ Key Ring, Wacky Green Hair & Holder . Condition is Used. Shipped with USPS First Class Package (2 to 3 business days). KOOKEY'S UNLOCK THE FUN DOG. STUFFED PLUSH AND BEANIE. 9" LONG PLUS 3.5" MORE FOR TAIL. CURLY BROWN FUR LOOK. 19" Kooky Lanyard with color lettering. Ko ok y K li c k e rs 19"Purple Lanyard with Breakaway Clip (4pk). 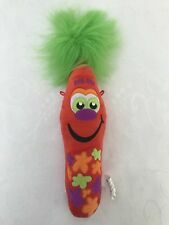 Adorable large(24 in) KOOKY Pen plush toy. Character from Krew 3- Sir Kookalot #14. We are happy to listen and help. New Kooky Kuddlers Plato # 149 - Krew 19. He is super plush and cuddly! After purchasing a stuffed pet, kids are given a secret code to enter the virtual world. Theyre then transported interactively to the Magical Island in the Sky a land discovered in 1851 by young adventurers Sylvester Von Koo and Mackey Moose where all animals - dog, cats, frogs, lions, dragons and rabbits - live in harmony.